The ecliptic is the path travelled by the sun, moon, and planets through the sky. Twelve constellations lie along the ecliptic, their symbols used by generations of world civilizations, both as night-time guidance by sextant and, in astrology, to predict character traits and the future. 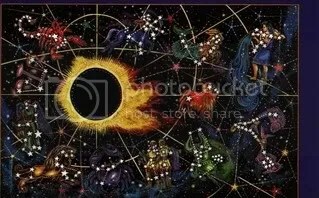 In both astronomical and astrological terminology, the sun passes through all twelve constellations or zodiac signs on the ecliptic during the course of one year. The path of the ecliptic can be seen to cross over the Milky Way at a 60 degree angle near the constellation Sagittarius. Where this happens, it forms a cross with the Milky Way, and this cosmic cross – also known as the ‘crossroads’ – was called the Sacred Tree by the ancient Maya. It has names in other cultures, too: most famous among them is that of the Norse, where it was called the World Tree, or Yggdrasil. In Britain, with almost no summer night sky to speak of, The Milky Way is usually thought of as a winter night sky spectacle. From our perspective on Earth it is the wide highway of stars arching through the sky, especially clear in northern winter. In the cloudless skies of ancient Mesoamerica, however, it could be seen after dark at almost any time of year, because tropical dusk happens quickly and almost invariably year-round at 6p.m.. So the Milky Way was (and is) a phenomenon of wonder to behold in Mexico and Central America. There this spectacular freeway of stars interspersed with blotchy areas of starless clouds can be seen along the entire length of the Milky Way. These ‘dark cloud’ formations are caused by interstellar dust. The most prominent of these is in astronomy called the ‘dark-rift’ or ‘Great Cleft’ of the Milky Way. It looks like a dark road running through the galaxy, pointing towards the centre or cosmic crossing point where the ecliptic bisects the Milky Way, near the constellation Sagittarius, or, according to the Maya, the fulcrum of the Maya Sacred Tree. The center of this cosmic cross, at a point where the ecliptic crosses the Milky Way, is coincidentally the precise centre of our Galaxy, a nebulous area of the Universe where stars are born and our own cosmic womb, from which we, as stardust emerged. This Galactic centre is exactly where the December solstitial sun will stand at noon on December 21st, 2012. This alignment occurs only once every 25,800 years. The Maya called this dark-rift the Black Road, or the Road to the Underworld. They seem to have imagined it as a portal to another world, and their prediction that the December solstice sun would re-enter its ‘birth canal’ in 2012 now appears to be fairly accurate. This special time, in Maya numbers, occurs at the end of one Great Cycle or 13 baktuns: the date 13.0.0.0, from an origin in 3114 B.C. Each baktun numbers 144,000 days and 13 baktuns equals 1,872,000 days since the beginning of Creation. In the Old World, myth was the language of the heavens. Oldest civilizations like Assyrian, Persian, Egyptian and Greek culture all saw the movement of the stars within a context of time, rather than space. This is a direct connection to ancient knowledge of the movement of the stars along the band of the ecliptic in a contrary direction to that of the zodiac. The earth was seen as laid through the ecliptic passing through the celestial equator at an angle of 23.5º which divided the zodiac into two halves: the ‘dry land’ northern half of the zodiac reaching from vernal to autumnal equinox; the other half representing the ‘waters below’ the equinoctial plane, or the southern arc of the zodiac stretching from autumn equinox, via the winter solstice, to vernal equinox. These mythological concepts dealt with Man’s measure of time, rather than quantifiable space. And over time ancient wisdom noticed that the equinoctial points, as well as the solstices, appear to move backwards through the constellations every 2,200 years, thus marking a phenomenon called the Precession of the Equinoxes. In Classical mythology, this movement of the heavens was thought to be the cause for the rise and fall of civilizations and Ages of Man. Each Age was named for an astrological sign and a time when in astronomical terms a particular constellation in the heavens appeared to rise at dawn on equinox. So as precession made its inexorable journey through time and the heavens, Man and civilization generally moved from the Age of Taurus (the Judaic era of the Golden Calf) through Aries (which Moses heralded on descent from Mount Sinai as ‘two-horned’) or the start of the new Age of the Ram; into Pisces, the Age of Christianity whose symbol was the fish; and now, from February 14th this year, the dawning of the Age of Aquarius. 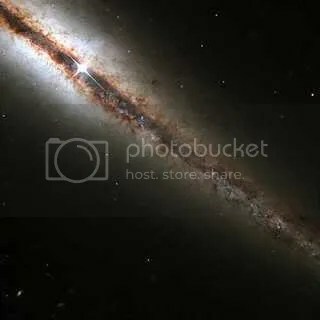 The Greeks saw the Milky Way as the Ouroborus or Serpent of Light residing in the heavens and, when viewed at Galactic Central point near Sagittarius, this serpent appears to eat its own tail. A crop circle which appeared on July 27, 2008 gave an earthly rendition of the Ouroborus, seen by both classical and Mayan scholars as symbolic of the winter solstice date of 2012 when the sun will appear to rise out of the mouth of the Ouroborus or the dark rift at the centre of the galaxy where the World Tree, the Sacred Tree of the Maya, the Sanskrit Sampo and the Norse Yggdrasil all meet. While Mythology has stood the test of time in many world cultures, it may be a surprise to learn that science has also discovered a new twist to the old tale/tail. For generations our acceptance that we are part of the Milky Way galaxy was unquestioned; yet this pathway in the heavens appears to rise from our earthly horizon at a 60º slant: odd if we are one sun within its great spiral of stars. It now emerges that the Solar System belongs to another galaxy which is currently colliding with the Milky Way. This fact was discovered when astrophysicists recently pursued investigations into the existence of ‘dark matter’ to account for fluctuations in energy which are measurable but invisible. By using infrared wavelengths of light below eye and optical telescope visibility, they detected the presence of a huge sister galaxy circling the Milky Way and colliding with it at – you guessed it – its point of centre near Sagittarius. It’s called the Sagittarius Dwarf Galaxy, or SGR. And its collision may be the source of a huge gravitational pull which influences the 11-year solar coronal mass or sunspot cycle. So, we really are stardust, colliding with our nearest neighbour, returning to the stars from which we came. And world mythology from our greatest civilizations, like crop circle designs from the cosmic consciousness, were trying to tell us this all along. This entry was posted on October 31, 2009 at 11:54 pm and is filed under astrology, astronomy, astrophysics, calendar, crop circles, culture. You can subscribe via RSS 2.0 feed to this post's comments. I admire your website , it’s full with great information. You just got one perennial visitor and a fan of your blog.